Video clip synopsis – Among the Natioinal Gallery of Australia's rarely seen treasures is an astonishing embroidered shawl from Kashmir in India--one off the finest and rarest of its kind. Broadband MP4 hidden12_bb.mp4 (17.4MB), suitable for iPods and computer downloads. The Godfrey Shawl is an episode of the series Hidden Treasures (15 × 5 mins) produced in 2006. Students should be able to analyse and discuss roles and methods involved in the presentation of artworks. Among the National Gallery of Australia’s rarely seen treasures is an astonishing embroidered shawl from Kashmir in India—one of the finest and rarest of its kind. Made in the 19th century from the superfine 'cashmere’ wool of the Himalayan mountain goat, it is actually a detailed map of Shrinigar, the former summer retreat of the Mogul emperors, showing its rivers, lakes, gardens and buildings. It’s just one of a number of beautiful Indian works preserved in the gallery’s textile collection. Maharana Jawan Singh Hunting was painted on cotton soon after the British took control of the great Rajput state of Mewar in 1818, attempts to recapture the golden days of the Rajput emperors. 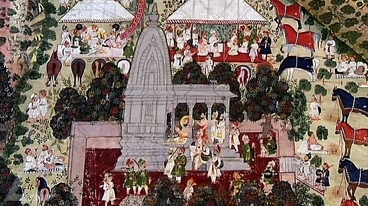 The painting has been arranged in the form of a mandala, with the emperor’s tent at the centre, symbolising political power, and the Hindu temple on the right, symbolising religious power. Its rolling perspective, which suggests the rotation of the universe and all things within it, is shared by the great landscape paintings of contemporary Australian artist William Robinson. Although Robinson’s Creation Landscape series comes from a very different time and place—not the jungles of Mewar but the rainforests of southeast Queensland, he also takes us on a spiralling sweep through time and space. From 19th century Rajasthan to 21st century Australia, there is a shared wonder at the universe in perpetual motion and a similar reverence for the splendour of creation. Discuss the principles of ethical behaviour, respect, care, knowledge and education involved in the conservation of cultural materials. William Robinson’s Creation Landscape series depicts a universe in perpetual motion and a reverence for the splendour of creation, unity and oneness in nature. Research and discuss how Robinson approaches his painting style, and how he uses elements and principles to create these artworks. Create a personal mandala. First, lightly draw a circle on a large sheet of paper. The circle may be filled in a spontaneous way, or filled with images that come to us in deep relaxation, meditation, through the use of visualisation techniques. Alternatively, fill the circle with scenes from everyday life, or objects of fascination from the world of nature.